When my attempt to reprint The Christlike Christian went nowhere, I began to entertain the notion of creating a modernized version of the book, which would include a few personal anecdotes of my own. After further consideration, I concluded that it made sense to simply write my own book using The Christlike Christian as a template while sharing my own unique experiences as a means of relating the message to a twenty-first century audience. 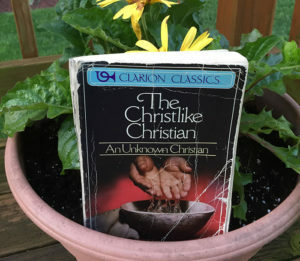 The Christlike Christian was written in the early twentieth century by someone with a pen name of Unknown Christian. It was last published by Zondervan in 1988, but had previously been published as part of their Clarion Classics series in 1960. This book has had a profound effect on my life in helping me become more Christlike, and I wasn’t content to allow such a powerful message to be lost on future generations. That’s when I decided to write my own book. Chapter 1 of DARE To Be Christlike opens with a humorous story about an awkward exchange between my wife and me that led to what I call a Nathan moment. Some may think of it as an Aha moment. Regardless of your point of view, I’m referring to a moment in your life when the light bulb finally comes on, and you recognize something about yourself that you’ve been blind to—possibly for a long time. The Nathan moment I experienced inspired me to re-read my worn copy of The Christlike Christian, and that led me to recognize my need to change—if I wanted to be Christlike.